Kozy Slippers by Kozy Collar are channeled top and bottom providing heat or cold to the entire foot, warmed from the microwave will help relieve the pain associated with Rheumatoid Arthriti, Raynaud's Syndrome, relax stiff muscles, aid with circulation and flexibility. Simple,quick and easy to use! For a pair of slippers just microwave on high 1 to 2 minutes,adjusting the heating time as needed 30 seconds more or less. The heat lasts about 10 - 15 minutes, and if you would like the heat to stay warmer longer we recommend that once they are on your feet you simply wrap a throw or like around the slippers or slide under the covers proving insulation for a much longer warmth. As an Ice pack the slippers will help reduce swelling and ease pain. For cold the slippers should be stored in a closed container (a plastic bag is fine ) and stored in the freezer. The slippers are filled with rice. 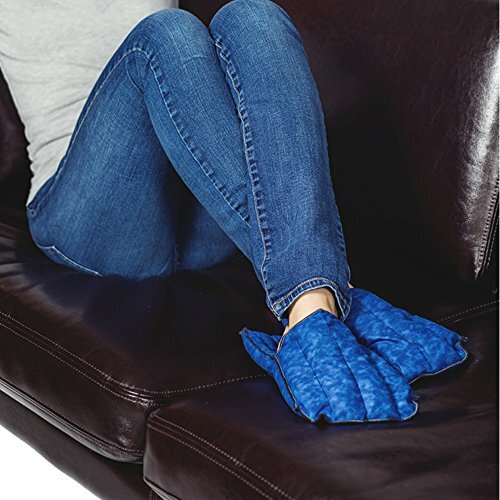 Kozy Slippers by Kozy Collar are channeled top and bottom providing heat or cold to the entire foot .The Kozy Slipper warmed from the microwave will help relieve the pain associated with Rheumatoid Arthritis, Reynolds Syndrome, relax stiff muscles, aid with circulation and flexibility. As an Ice pack the slippers will help reduce swelling and ease pain. May be used on hands. If you have any questions about this product by Kozy Collar, contact us by completing and submitting the form below. If you are looking for a specif part number, please include it with your message.